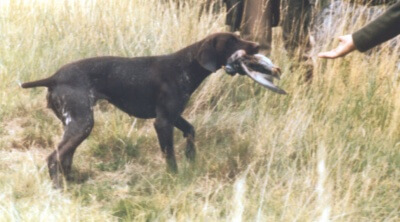 Welcome to the world of dogs, or more specifically Hunt Point and Retrieve Gundogs, which includes German Shorthaired, Longhaired and Wirehaired Pointer, Weimaraner, Hungarian Vizsla, Hungarian Wirehaired Vizsla, Brittany, Italian Spinone, Bracco Italiano, Large Munsterlander and several more. All these breeds compete on equal footing in HPR Field Trials, Working Tests, Spring Pointing Tests and Field Training Classes. For many working dog handlers, field trials are their final goal. The most appropriate route starts with your local training class followed by Working Tests, Spring Pointing Tests and finally Field Trials. Classes are usually run on a monthly basis and cover every aspect of field work. Many people are afraid to attend classes in case their dog disgraces them. Don’t worry; the instructors have seen it all before and many dogs which run wild in early training, become paragons of virtue – well almost! Classes are usually divided into Puppies, Novices and Advanced dogs. Initial training includes socialising and obedience, whilst later work will cover retrieving, jumping, water work, hunting, pointing, introduction to shot, tracking, steadiness and use of wind. All this work will be of vital importance when competing in later disciplines. Dogs walking and sitting in close company without growling playing. Learning to obey all commands by voice, whistle and hand signals. Dummy thrown seen by dog then retrieved. Dummy placed on ground, seen by dog which is then away. Dog sent to retrieve on command. Dog asked to retrieve dummy which it has not seen fall or placed, requiring obedience to hand and whistle signals. Introduction to negotiating streams, walls and fences etc. In streams, canals, lakes and reservoirs. Over all types of ground, moorland, stubble, crops and woodland. Introduction to pointing on live or placed game. Using blank cartridge pistols and shotguns. Using dead game pulled along the ground to provide scent. Using special pigeon spring trap, or live game. Steadiness to point and flush in the controlled conditions of a rabbit pen. Learning to use wind correctly from all directions. If your training class work is progressing satisfactorily you may be ready to enter your first working test. Tests are usually set in the summer months so as not to clash with shooting days or Field Trials, although Kennel Club Rules state 1st January to 31st December. For schedules or entry forms contact the Secretaries, Field Trial Secretaries or Training Group Secretaries of the breed clubs running the Working Tests. You will need to provide your dog’s Kennel Club registered name and number. This information will be found on your Kennel Club Registration Certificate. 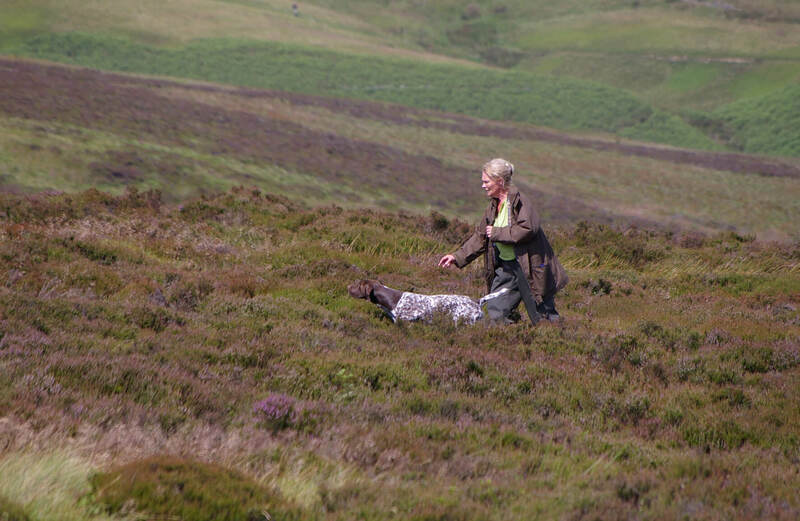 Working Tests are competitions for the purpose of assessing, without game being shot, the working abilities of the various HPR breeds. The tests offered are dictated to a certain extent by what the ground itself has to offer e.g., size, cover in fields and natural obstacles such as gates, fences, walls and access to water in the form of a stream, river or lake. The tests themselves are divided by age and ability. Confined to dogs whelped not earlier than 1st January in the year preceding the date of the test. Confined to dogs which have not gained a Field Trial award or first, second or third in an Open Working Test or first in a Novice Working Test held in accordance with KC Regulations. For dogs of a specified breed or breeds, although preference may be given to dogs which have won a Novice Working Test or gained a Field Trial award. Only Puppy, Novice and Open Tests are defined by the Kennel Club. Other classes such as Graduate or Intermediate are ‘unclassified’ and can be defined by the organising club. Each class will have a separate Judge. The Open class will have a Kennel Club Field Trial Panel Judge. In working tests with large numbers of entries there may be two judges per class or a separate judge for the water retrieve. 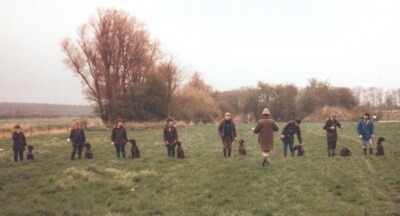 Each class will usually include four separate tests, two for retrieving, one for hunting and one for water work. If hunting features in a working test then the dog will be required to quarter open ground in a zig zag pattern. For Puppy and Novice dogs this will be with their noses into the wind, i.e., the wind coming towards you, but for other classes it could be with cheek/side wind or back wind. 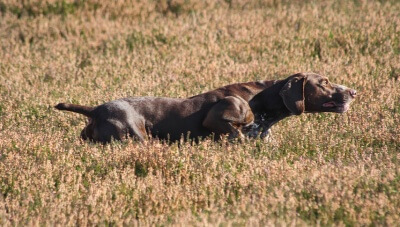 The more advanced dogs may be required to point planted game and there could be a distraction such as an artificial bolting rabbit or steadiness expected when a shot is fired. If flushing is being judged, pigeons are used sometimes with a special trap that springs them clear of the dogs. There are usually two separate retrieving tests, and these will vary according to the quality and quantity of ground available. For the puppies there could be seen, split or memory retrieves of a dummy, over a short distance of about 20-25 yards on short grass. 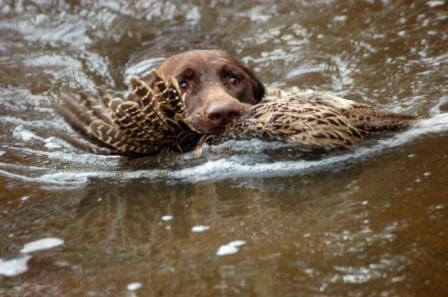 The novice dogs would have similar retrieves over a greater distance of perhaps 30-40 yards and may include a blind retrieve or a retrieve fired from a dummy launcher. For the graduate and open dogs the length is again stretched to 50-100 yards and may include retrieves from woods, negotiating fences, walls and streams. This was once the achilles heel of HPR dogs but over a number of years with the inclusion of water tests in all our events our dogs can compete on equal terms with any other breed of gundog. The nature of the tests will be subject to the water available which could be a deep stream, canal, small lake or reservoir. The puppies will be given a simple seen retrieve from about 10 yards from the bank with an easy entry into the water. Novice dogs will have a longer retrieve of about 20 yards, possibly with a shot fired. The graduate test may require the dog to swim across the water for a seen retrieve on the opposite bank and the open dogs are usually expected to retrieve an unseen dummy from the opposite bank. There may also be some form of distraction. The Kennel Club expects a dog to swim readily on command, but accept that if they return around the edge of, say, a pond, the contestant should not be penalised. The Guidelines point out that the emphasis of these tests is on the natural working ability of the dog on open ground, assessing ground treatment, hunting and pointing with an element of steadiness, but no birds will be shot. The dogs are run singly into the wind, and should cover about 100 yards on either side of the handler. Each competitor has a run of about 10 minutes and is allowed 1 minute to settle down before judging commences. The dog will be required to hunt with drive, purpose and good pace with correct head carriage, ranging wide and always turning into the wind, whilst covering the ground with style. All game birds on its beat should be pointed and other game honoured. Every dog graded will be given a verbal critique by the judge and an assessment certificate at the end of the day. What the judges are expecting in order to grade dogs in the categories Excellent, Very Good and Good is detailed in the Spring Pointing Test Guidelines within GSPC Events. When your dog has reached a high standard of training and has experience in the shooting field you can consider entering field trials. All the blood, sweat and tears you have put into your dog will, hopefully, be about to pay off because only by success in field trials can your dog become a Field Trial Champion. If you also compete in shows and your dog has become a show Champion, with an award in Field Trials he will become a Champion, or if he is a really exceptional dog and becomes a Show Champion and a Field Trial Champion he will have achieved the sport’s highest accolade Champion and FT Champion (‘Dual Champion’). Only 9 GSPs have ever achieved this honour. For field trial schedules and entry forms contact the Field Trial Secretaries of the clubs running the trials and as before you will need to provide your dog’s Kennel Club registered name and number. There are three different types of stakes, Novice, All-Aged and Open and the definitions for each are given in the Kennel Club Field Trial Rules and Regulations printed later in this Yearbook. Dogs shall be required to quarter ground in search of game, to point game, to flush on command, to be steady to flush, shot and fall, and to retrieve tenderly to hand on command from land or water. Field Trials are always held in the shooting season from 12th August to 1st February inclusive, and should be run as nearly as possible to an ordinary rough shooting day. There will be a maximum of 12 dogs running singly (or 18 dogs in a 2-day stake). Two judges will see each dog run and if they are to eventually figure in the awards they will be given at least two runs. On open moorland dogs will need to run about 100 yards on each side of the handler but this distance will be reduced when working fields of crops and in woodland. It is important for the handler to stay in contact with his dog and if all goes well the dog will hunt, find game and point, flush the game on command, then retrieve the game when shot. However, if the gun misses, the dog may be recalled later for a retrieve which another dog has provided or failed on. This could be a blind retrieve, so the dog must be of a standard where it is capable of achieving this. It goes without saying your dog must be safe with all farm animals, chickens, cats, sheep, horses and cows etc. A dog will be eliminated immediately if it chases any of these. When entering a field trial you will be signing an entry form stating that you agree to abide by the KC Regulations so you obviously need to be familiar with these before you enter. A full copy of the KC Rules and Regulations can be obtained from the Kennel Club, however, excerpts of them can be found by clicking here. Good sportsmanship is of paramount importance. We use field trial grounds by the kind invitation of our hosts. Without their hospitality we would have nowhere to prove the abilities of our dogs and enjoy the camaraderie of like minded folk. I hope you enjoy your dogs and your days with them.